No matter how hard women work or how much they accomplish in a day, there's lingering anxiety and guilt over what they didn't do. Glynnis Whitwer has identified what makes us feel so overburdened, and it's probably not what you think. 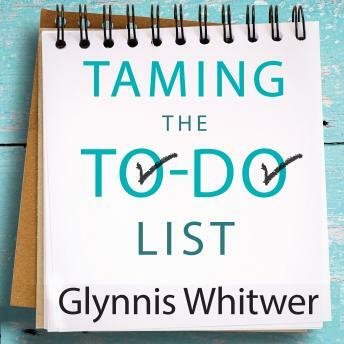 Taming the To-Do List exposes a seismic shift in our society: from one in which most of us were proactive toward one where we now carry the burden of having to respond to every email, text, tweet, and message we receive. This major shift creates a cycle where everyone else sets the priorities for our days, rather than us designing our own lives. Taming the To-Do List addresses this significant change in how we manage our time and the issue of procrastination from a woman's point of view. Combining practical, easy-to-apply advice with solid research and biblical truth, this book is a compassionate yet challenging message of hope for those struggling to choose their best work over busy work.